Can Chilima Succeed Where Others Have Failed? Malawi's leading daily newspaper, The Nation, has used its editorial comment to add the voice of support to what the some civil society organisations (CSOs) have said in backing Vice-President Saulosi Chilima stance on ending corruption in Malawi as a bold move. Chilima said when he launched his United Transformation Movement (UTM) at Masintha ground in Lilongwe on Saturday, that his movement is ready to usher in the change Malawi needs among others to genuinely fight corruption, end nepotism and impunity - which he accused the Democratic Progressive Party (DPP) led government of perpetuating the vices. The CSOs have welcomed his pledge and in an editorial comment titled ' Well said Mr Vice-President, but go beyond rhetoric', The Nation said lauded Chilima for committing to enhancing the independence of the Anti-Corruption Bureau (ACB) through legal and constitutional reforms, including stripping the presidency of immunity from prosecution. The paper agrees with the CSOs that what Chilima said at UTM launch is "indeed a bold statement" especially coming from a person holding the Office of the Vice-President. It pointed out that, it is not the first time Chilima to rap the DPP-led government of embrassing levels of graft, saying he has spoken before about corruption. However, the paper urges Chilima to "go beyond podium rhetoric and swing into action in fighting corruption in the country even as a whistleblower." It said that way, the electorate will take Chilima's tough stance on corruption seriously in the run-up to the 2019 Tripartite Elections. "By openly condemning corruption in a government he is serving, the Vice-President has already taken a bold step. But he should do more," says the influential daily in the editorial. The paper pointed out that corruption has destroyed Malawi, costing the public good service delivery in health, education, agriculture and infrastructure development sectors. "Corruption and fraud have cost this country its reputation as it keeps sliding on corruption perception indices," reads the editorial. 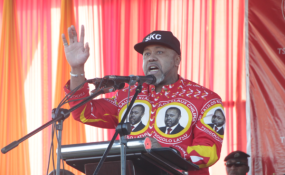 Chilima told crowds at Masintha ground that "a corrupt -free Malawi is possible", a statement agreed by CSOs that it can be achieved with greater political will from the leadership. SKC - as Chilima is fondly called by his supporters - warned that he will reveal more rot in DPP as well as "name and shame" those who are involved in corruption. The ruling DPP has been plagued by calls from CSOs for President Peter Mutharika to resign after a leaked report by the Anti-Corruption Bureau accused Mutharika of benefiting K145 million ( $195,000 ) from Zameer Karim of Pioneer Investment , whose firm is being investigated on a contract to supply food to the police. "K145 million payout to DPP and the President is just a tip of the iceberg; there is more rot in government. In days to come I will expose more corrupt activities happening including in the procurement of gensets for Escom," said Chilima, 45, who was handpicked by President Mutharika to run alongside him in 2014 presidential race on DPP ticket. Chilima, who will contest for presidency on UTM ticket in the 2019 watershed polls, said when voted to be Head of State, he will give a 30-day amnesty to all those involved in the plunder if public resources to return the money or face the law. "May I call on those who have stolen government money to start paying that back. Next year, we will only give an amnesty of 30 days for all those to pay back our money," he said. Laying down a 12-point plan for UTM, also hinted at having presidential immunity removed. On Anti-Corruption Bureau (ACB), Chilima said UTM will ensure that the law is reformed to have the Director General of the institution appointed by Parliament, in a transparent and competitive manner.